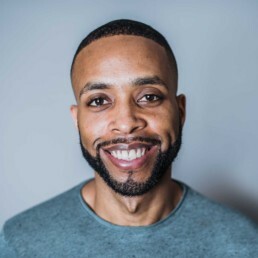 Curtis Smith is an Educator, Speaker, and creator of Moment of Mindfulness (MOM), a mindfulness methodology and company committed to empowering communities to activate their best intentions through culturally responsive yet evidence-based mindfulness tools. In 2013, Curtis co-founded Vista Academy, one of the top rated public middle schools in Brooklyn, New York. In his 10th year as an educator, he leads the mindfulness program that’s infused into the schools mission, Character Education. The impact of the program has not only contributed to Vista Academy’s improved learning community, but also led to his work New York City Department of Education District 19, where he facilitates and designs workshops for Barack Obama’s My Brother’s Keeper Alliance. Throughout his work and groundbreaking methodology, he’s transformed thousands of lives in over 33 NYC Public schools by using music, movement, art, and writing to activate the science-based benefits of mindfulness. Curtis is one of the highest rated educators in Brooklyn and holds a bachelor’s in political science from the University of Michigan, a master’s degree from Brooklyn College in the Science of Education, a certification in Mindfulness and Loving Kindness from The Path in partnership with The Nalanda Institute, and is a recent RISE for Educators recipient from Kripalu’s Center for Yoga and Health.